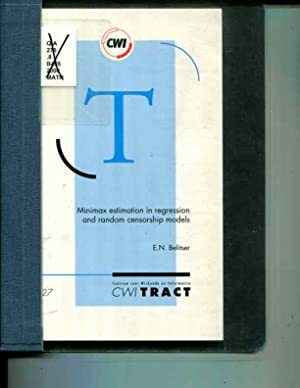 Minimax estimation in regression and random censorship models (CWI Tract, 127): CWI Tract 9789061964889 Unknown Binding - Orca Knowledge Systems, Inc.
We specialize in the hard sciences and mathematics books including astronomy, physics, artificial intelligence, and more. Additional specialties would include psychology, history, business and management. Money back guarantee if not satisfied with the transaction. Will hold the book for 10 days awaiting payment. Will ship FedEx. Please email for shipping charges. Personal checks made payable to Orca Knowledge Systems Inc. Accept paper money orders. Accept Purchase Orders and will bill libraries and universities. Also accept credit cards through PayPal (contact us directly and I'll send you an invoice). Orders usually ship within 2 business days. Shipping costs are based on books weighing 2 lbs, or 1 KG. If your book order is heavy or oversized, we may contact you to let you know extra shipping is required. Bookseller: Orca Knowledge Systems, Inc.